Darwin and the surrounding areas of Australia's Northern Territory have good shopping facilities and you will be able to get most things you could ever want or need. Visitors will find that the air-conditioned Mitchell Centre on Mitchell Street is a good place to start, with more than 30 shops, plenty of eateries and free parking. One of Australia's most highly regarded centres for Aboriginal arts, Darwin has a large concentration of shops along Knuckley Street and Mitchell Street, with shops selling a range of authentic local Australian souvenirs, such as didgeridoos, boomerangs and Aboriginal paintings. 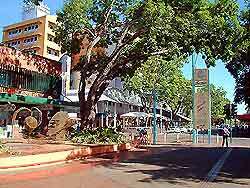 The main shopping centre in Darwin is situated close to the tourist office and Cavenagh Street. Casuarina Shopping Centre and Smith Street Mall are large pedestrianised precincts. Most shops in the Darwin and Northern Territory area of Australia are open from 09:00 to 17:30 Monday to Friday and on Saturday and Sunday from 09:00 to around 12:00. 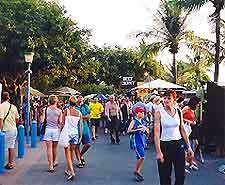 There are several markets in Darwin attracting thousands of visitors and featuring an exciting atmosphere. These markets are full of local handicrafts, Aussie gifts and handmade items, most of which are fairly inexpensive. On Thursday evenings the extremely popular Mindil Beach Market attracts large crowds of people, including locals and tourists visiting Darwin. Mindil Market features numerous handicrafts, clothes, jewellery and handmade items and is always full of bargains. The Mindil Beach Market also features tempting food stalls serving a wide range of tasty dishes. Market stalls and market traders in Darwin do not accept credit cards for purchases and cash is always the best way to pay for your market goods. Prices markets are not usually fixed and often with some friendly haggling, the price can be reduced.